The technology exists to cut animals out of this process altogether. We need to make this happen. Researchers from the University of Leeds and Avacta Life Sciences have developed a new tool for studying biological molecules and processes, one of which could replace animal-derived antibodies. Affirmer proteins can bind tightly to molecules just as animal antibodies do, allowing scientists to study the molecules up close. 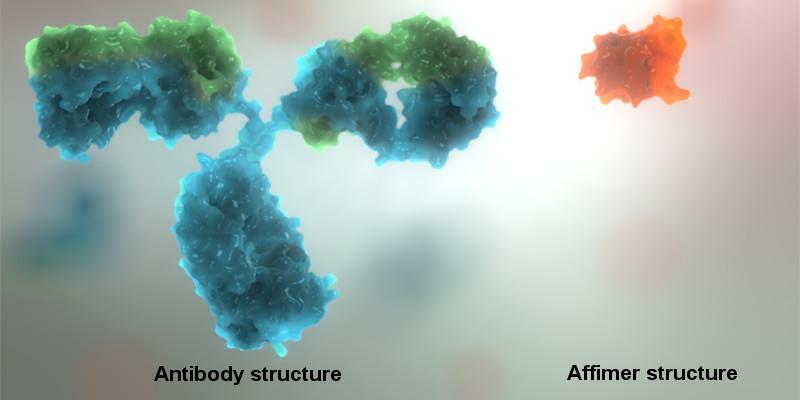 Affirmer technology has several additional strengths that make it superior to animal antibodies: the proteins are smaller, more robust, require less time to produce, are more specific to the intended research targets, and easier to modify for different applications. The research team demonstrated that the Affirmer technology was successful, producing results similar in quality when used in place of antibodies in a wide range of routine procedures. In addition, due to its smaller size, the Affirmer technology yielded superior results for the new super-resolution microscopy technique. The tiny size of the binding protein allowed scientists to observe the behavior of individual molecules more closely. Antibodies are reactions to anything alien that invades an animal at the molecular level. Animal cells produce large, complex proteins that are made to order, so to speak. It’s their tailored structures that allow them to locate and monitor what foreign substances — from viruses and bacteria to simple molecules — are doing inside the animal’s cells. To study a specific molecule, scientists can create antibodies to it by injecting that molecule into animals and waiting for the animal’s body to begin producing antibodies. Researchers can then extract the antibodies from the blood for purification, then use them as tools and diagnostic tests. The team’s research has proven that the technology exists to cut animals out of this process altogether — and probably with more accurate results, too. This comports with what is generally considered to be the “middle ground” in the debate on the ethics of animal testing. With equal or better results — and an ethical quandary eliminated — it’s safe to say this breakthrough technology is going to change research for the better.